For the millions of ex-Palm OS users, getting data off their old PDAs and Treos and on to their shiny new iPhone, Blackberry, Palm Pre smartphones – or cast off into online cloud accounts like Google Calendar – can become a fearsomely fiddly task. Although there’s no end of commercial and free solutions being offered, getting all your data successfully transferred over to your new device can prove a daunting and frustrating prospect, with one person’s success story another’s devastating failure. For us, the stakes were high. With our Palm heritage dating back to the trusty old Palm VX from 1999, we had over ten year’s worth of calendar appointments and there was a lot of stuff in there we desperately wanted to keep. Despite our best efforts – and after trying out a whole load of bodges, fixes and wheezes – we’d failed spectacularly to get all that lot uploaded onto our Google Calendar, leaving our smartphone bereft of all but the most recent data. With failure staring us in the face, the cavalry came to the rescue in the shape of the Dba2Csv and Palm2Google program offered by a small UK developer. It’s not a looker, that’s for sure – anyone looking to be wooed by a slick interface is likely to be bitterly disappointed (think: Windows 3.11 with extra brown hues). The help files and slideshows do little to reassure, being excessively wordy and, frankly, rather ugly to look at. This isn’t entirely the developer’s fault because no matter how you spin it, it’s a bit of a spoddy operation, and the process of importing your data will most likely force you to spend a little bit of time tweaking t’ings. Priced at £30, you’re looking at paying a premium price too, but that price does include full, hands-on support and a money-back guarantee (see the bottom of this article for the developer’s statement). It may not be pretty to look at, but Dba2Csv and Palm2Google (snappy name, eh?) certainly got the job done for us, with over ten years of calendar data finally now viewable on our iPhone and Android phones, as well as online in our Google Calendar. Result! The job ran pretty smoothly too, although we were helped throughout the process by the developer, who enthusiastically talked us through the minor glitches we encountered, and responded to all emails in a timely manner. Getting your data off your Palm and onto Google Calendar is fairly straightforward although this really is a case where RTFM is highly recommended. The steps are explained in the mud-brown interface, but before you start make sure you back up all your online calendars, just in case. Once you’ve opened up the program, start by inputting your Google user name and password. The next step is to import your Palm desktop database, and you’re given several options as to how you’d like Google to import that data. 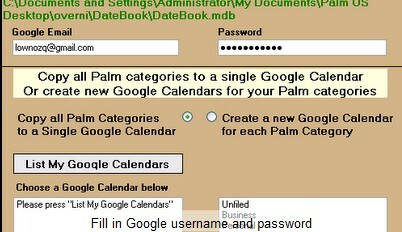 You can elect to have all your Palm calendar categories copied into a single calendar, or you can create a new Google calendar for each Palm category. Then it’s a case of hitting the ‘copy to Google’ button and sitting back while the program does its thing. If you’ve got a lot of data to copy over, it might be worth getting the kettle on (we’ll have ours with milk and no sugar, thanks), because it can take some time – a process not helped by Google’s propensity to throw the odd wobbly mid-transfer. If you find the process has timed out or all your information hasn’t copied over, we recommend starting over – we just deleted the Google calendar and started again. It took us three goes to get all our data across, but at the end of it we – finally – had our entire Palm calendar uploaded and accessible online. Huzzah! If a users data contains more than about 10,000 events then your advice to “just delete the Google calendar and started again” will not always work because of the Google Quota. 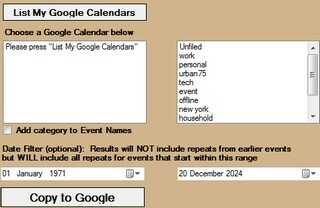 In this situation any amount of deleting and trying again will just not work, so the best solution is to use the “Save Session” function and wait for 24 hours; when you use sessions the program remembers exactly which events have successfully copied, and to which calendars events should be copied if you selected to copy each category to its’ own calendar. You may have been lucky with this; I have seen 19,000 events copied to Google in one go (followed, however, by three days of refusals…), but I’ve also experienced the quota block at 8,000. With all our Palm data converted into Google’s calendar format and effectively ‘future-proofed,’ we’re now able to view a decade’s worth of events and appointments on just about any smartphone, with the ability to export the content out of Google into several other formats. It’s a pricey process alright, and it’s not exactly the greatest of user experiences, but that’s more to do with the fiddly intricacies of converting Palm’s database format than the failings of the program itself. However, with the author providing prompt, hands on support (see author statement below), we’d say it’s money well spent protecting your data and making sure your new smartphone can access your whole calendar. For anyone with a lot of precious data trapped on their old Palm OS device, we can thoroughly recommend Dba2Csv and Palm2Google. Its not pretty, it’s not cheap, but it gets the job done, and if you’ve been struggling to convert your data, this is just about the simplest and quickest solution available. We quizzed the author about his pricing policy, and were so impressed with his answer, we’ve reproduced it below. In the good old days of Palm Desktop 4, disgusted at the way Palm had locked down my data, I decided to switch from reverse engineering software to building something I actually needed – so I wrote Dba2Csv and put it on sale for £10. The conversion was via CSV which was less than ideal because of the way CSV handles repeat rules (it can’t), but in the face of a complete lack of documentation of the PD4 .dba format I managed to get nearly 100% accurate results where Yahoo! import/export and other paying methods messed up my dates, times, repeats etc. Dba2Csv users didn’t need much help, you just opened a .dba file, set the settings, and saved in CSV format. With the introduction of Palm Desktop 6 (one of the worst pieces of software ever) Palm changed the format for palm calendar data files without changing the extension. By doing this, Palm have confused half their users to the point where they often do not even know which time of Palm file they have… Most of my clients have tried the Palm “Data Transfer Assistant”, Yahoo! import/export and other free/paid methods before stumbling on to my website, tired and usually completely fed up. The price of £30 definitely puts off some people who’d like to use my software. However, I operate on the principle that money is a symbol of the importance others attribute to my work (a lesson learned as a very underpaid professional “jazz” musician). Strangely, the more people pay the more likely they are to actually read the documentation, harass me to find a solution when things don’t work as planned, and finally get their data into Google. Also, for every person who has finished using my software after 30 minutes with no trouble at all, there is another who has required hours, and sometimes days of personal support to get around the various problems associated with Palm Desktop, unreadable Dba files, Windows, and mysterious Google Calendar Quotas… I also help with the next step from Google to Droid, iPhone, Outlook etc – and if at any point during all of this my client decides she wants her money back, then I refund in full in exchange for an explanation why. I transferred about 5000 calendar entries from my Palm to my iPhone. It was not easy. Upgraded from Palm 4 to 6, then transfer to Google, then to ics file. Lotus Notes only accepts 500 entries per import, so divided the ics file into 12 files and imported one by one. Our company uses lotus notes which is sync’d to our iPhones. So now my iPhone is sync’d to my Lotus Notes (email, contacts and calendar). It was not fun, but would have been 10 x worse without this program. My Palm was a TX. I live in Western Canada. I am thankfully Palm free (although my Palm served me well for 10 years). Wish I could rate the program somewhere, if I could it would be 5 star. WOW !!! What a great experience. The Dba2Csv was a painless experience and I got just about every calendar event from the last 10 years from my Palm to Google. The developer did a fantastic job of creating an interface that provides straight-forward instructions and with the assurance of technical support if needed and a money back guarantee – it’s a great buy. I didn’t find the price at all prohibitive particularly when you consider the time it saves you in trying to get your data (and finally your life)out of Palm and into a more universally recognized format. THANK YOU – Dba2Csv is EXACTLY what I needed. Does Google have an area for tasks and memos and is there software available to transfer this data? Tasks (ToDo’s) are best managed by ToodleDo (http://www.toodledo.com) which can import the native Palm .tda format (from Palm Desktop 6) and display the results in a variety of ways, such as a Google Gadget. Unfortunately there is currently no satisfactory way to get Palm Tasks into Google Tasks (which is still rather “beta”). The good news is that ToodleDo is better anyway, and it’s free! Memo’s can be exported as .csv or .txt from Palm Desktop and imported to the software of your choice (such as a Google Docs spreadsheet). While we’re on Palm Desktop exports – a lot of people have trouble moving Contacts into Google simply because it is not really obvious that you need to select them all (Ctrl-A) in the “Contacts” section of Palm Desktop before you “Export as vCard” from the File menu. The vCard file can then be imported to Gmail Contacts and the results are very good (unless you use extended fields for which Gmail Contacts has no equivalent).